In case you missed it, we are pleased to share that the Virtual Lab School and all the good work you and your 30,000 colleagues around the world do was introduced to over 100,000 alumni from OSU’s College of Education and Human Ecology in a recent Inspire article, an annual publication of the College. It is an honor to have a spotlight in this publication, which highlights a myriad of important projects across the college. Like the thousands of parents on installations worldwide who notice and appreciate all you do to support their children, this piece focuses on staff Sergeant and parent Misty Hobbs. She commends the Wright Field North Child Development Center staff who operate “like a family unit.” Dr. Cynthia Buettner shows how the VLS delivers quality professional development for military staff on the move—and can even serve as a model for the nation with its mission-critical focus of continuity in early childhood care. Barbara Thompson (Retired, former director of the DoD Office of Family Policy) describes the benefits of the VLS and its state-of-the-art platform. 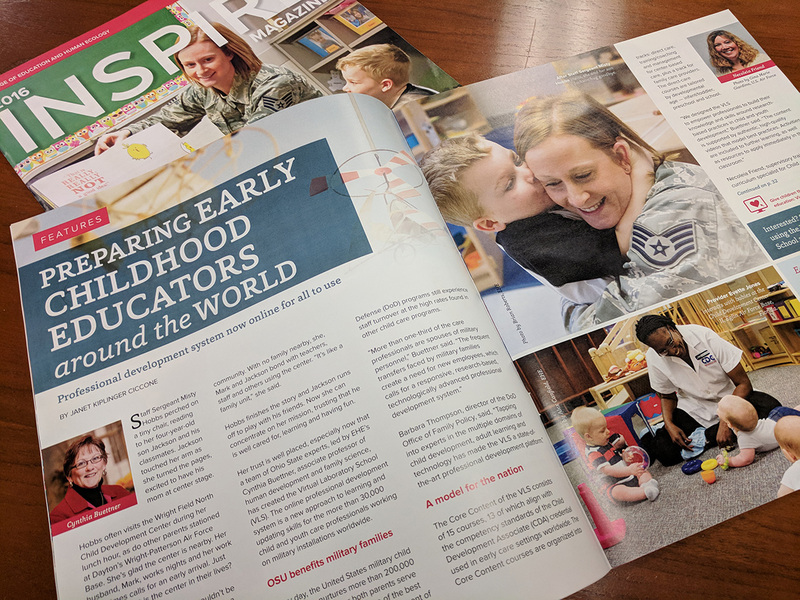 Read the brief, full article here: https://inspire.ehe.osu.edu/2016/05/05/preparing-early-childhood-educators-around-the-world/ and check out the entire 2016 edition of Inspire Magazine here: https://inspire.ehe.osu.edu/2016-inspire/. Finally, Necoleia Friend, Supervisory Training & Curriculum Specialist at Wright-Patterson Air Force base, is featured in a great video that spreads enthusiasm for this research-based professional development tool that lets you provide quality early care around the world and around the corner. We hope you are as proud of the work you do each day, as we are to support you in this important endeavor. Check out the two-minute video above!